Therapeutic horseback riding and equine-assisted learning and activities for children and young adults who face cognitive, social, emotional and physical challenges. As a small, volunteer-based organization, we offer an individualized program for each rider. Giving forty-five minute, one-on-one lessons, we are able to tailor every lesson to each rider’s evolving needs and personality. We work closely with parents to design lesson programs for their children that advance both short- and long-term goals for social, emotional and physical growth. Lessons typically involve grooming, tacking up the horse, leading, riding, and other barn related activities. Each lesson engages a team consisting of the rider and horse, an instructor and one, two or three volunteers. Lessons are designed to offer a consistent environment of acceptance and success. We work diligently to create engaging and stimulating activities that build each rider’s horsemanship skills. From the moment a child arrives at the farm, every activity is therapeutically directed. Riding, feeding the horses, doing barn chores and participating and socializing with other children provides challenges and immeasurable benefits… all under the guise of fun. For individuals with physical disabilities, riding a horse simulates the walking motion of a person, which aids in improving muscle strength, posture, flexibility, balance and coordination. The motion experienced while riding a horse provides the pelvis and hips with forward rotational movement in a synchronized alternating motion. Participants who are semi- or non-ambulatory can gain benefits from this experience through passive contraction and extension, which helps tone and supple muscle groups. Through the nature of the horse’s movement, our students are able to achieve goals that are beneficial in a therapeutic way. For students with cognitive challenges, riding helps improve concentration, attention span, memory, speech and communication skills. For participants who are struggling behaviorally and emotionally, interaction with horses teaches teamwork, communication and responsibility. All students are challenged with success-oriented experiences which build their self-esteem. Therapeutic Horseback Riding lessons are one-on-one and will meet for 45 minutes one time per week during afternoon hours Monday through Friday. Maximum balanced weight is 180lbs. 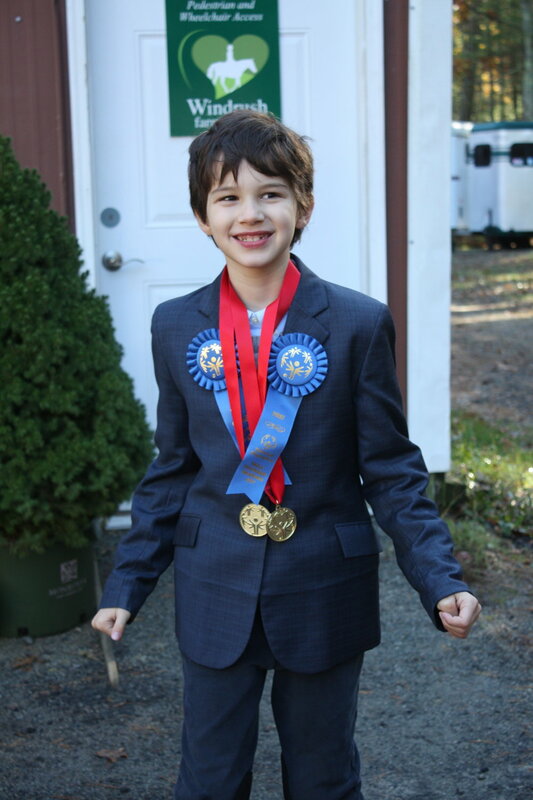 Each October, more than 50% of our therapeutic horseback riding students compete in the Special Olympics North Shore Fall Equestrian Tournament, hosted by Windrush Farm in Boxford, MA.